2015: My Year Of Living Vulnerably – No bluffing! I had occasion just before Christmas to have a psychologist dig in my brain. A comms pro who spins words, and a psych who reads words for nuance are always going to make interesting jousting partners. I call it a dislike of navel gazing, he named it denial. Ouch. I call it independence, he named it an unwillingness to ask for my needs to be met. Ouch again. I call it creativity, he termed it hiding behind the keyboard and being unwilling to be vulnerable in ‘real life’. Ouch thrice. I call it dry wit, my nemesis suggested it was avoidance: the chance to take a deep in-breath while i laugh, in order to settle myself rather than cry. By the end of the book, I think my nemesis was half-way wrong and three quarters right. Half-way wrong because I identify with Brown’s vulnerable ‘wholehearted’ people in her book from the perspective of my own resilience. Yet three-quarters right because by the end of the book I had come up with a new diagnosis, one that Brown doesn’t touch on, promoted by my hour with the psychologist. The vulnerability double-bluffer. I suspect there are lots of us out there. The vulnerability double-bluffer does honesty well. We don’t anxiously overshare, thanks to resilience, and due to independence we do not seek to to drag others into our story. But here’s the double-bluff: we give out our ‘medal’ vulnerability stories, the ones we have won over and made peace with, made acceptable, and we shine them up like medals pinned to the chest of our soul. We double-bluff ourselves that we have been vulnerable, when instead we have merely shared the echo of vulnerability. Yet that echo is enough for our audience, our friends, our loved ones, and, dangerously, often ourselves – sucked into the double-bluff. If it walks like a dog, looks like a dog, barks like a dog, then, yes, it’s probably a dog. Vulnerability double-bluffers are good at it too. We can spit out vulnerability medal stories to you face to face, across an audience of hundreds, or via a blog and receive compliments about how raw and open and honest and vulnerable we are being. Yet to share only the medal vulnerabilities whilst telling ourselves we’ve just been truly vulnerable? What are we cheating ourselves out of? Back to Dr. Brown’s book. She challenges the cultural myth that vulnerability is weakness and argues that it is, in truth, our most accurate measure of courage. The danger being a vulnerability double-bluffer means we think we are being brave, we think we are displaying courage – and to all intents and purposes we are – but we’re actually not digging deep enough to truly feel it. Imagine dipping a bucket into a well and it coming up half empty. Double-bluffers need to dig deeper. To get the full bucket of love, belonging, joy, empathy, innovation, and creativity that vulnerability delivers. Double-bluffers have to admit they are only sending the bucket down halfway. The only person I am truly vulnerable in front of is God. With Him there are no shiny vulnerability stories to hide behind. As I have walked along this new Christian path I have learnt the more vulnerable I become with Him, the closer He draws. To paraphrase Augustine, God made me for himself. And the more He gets of me, the more vulnerable I become in front of Him, the stronger our relationship grows. “Those who love their life in this world will lose it. Those who care nothing for their life in this world will keep it for eternity.” John 12:25. Jesus is talking about a life in which we make ourselves vulnerable – to God and others, even to those who reject us. Pouring out ourselves for others unconditionally, and trusting God to fill us back up. So if I can have this incredibly close, personal, awe-inspiring, miraculous relationship with the flipping creator of galaxies beyond my imagining, whose love for me is immeasurable and I receive all this stunning amazingness by being vulnerable – well, imagine what being vulnerable can do to my small, contained life and the relationships within it? Which is why 2015 is my year of living vulnerably. 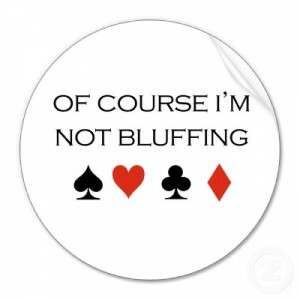 No bluffing. No folding. No matter the cards. ← The SAP ain’t heavy. He’s my…oh, c’mon, really?